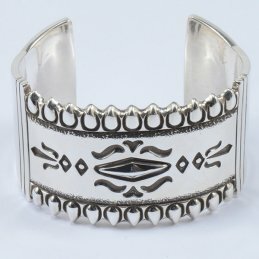 Born in Keams Canyon, Arizona, in 1964 and raised on a remote area of the Navajo reservation, Jennifer Curtis, the daughter of famed silversmith Thomas Curtis, began playing around in her father’s studio at the age of eight. As a teenager, during the lazy days of summer she would spend countless hours helping him file and rough polish his creations. Jennifer has always been fiercely creative and learned everything she possibly could from her father during this time, but she did not get serious about making her own jewelry until her early twenties. Starting out she wanted to be different from her father, making her own style of contemporary earrings, bracelets, and rings, allowing the rug patterns in her grandmother’s weavings and her father’s teachings to inspire her. As years passed, she began to pick up her father’s work and examine it for guidance and encouragement, remembering how he would lovingly challenge her. She slowly began making more traditional work, admiringly crediting his meticulous style. Today she is honored to carry on his exquisite approach to jewelry making utilizing Thomas’ handmade steel die stamps he passed on to her and his use of heavy gauge metals. She continues to reference her father’s work, noting him as her biggest inspiration. Perfectly executing deep precision stamped patterns which she creates into powerfully beautiful designs, Jennifer’ work stands out as a refined, classic aesthetic with an exhilarating allure. Her love for her work is strengthened through the bond she feels with her materials, “All of the elements I work with, (the silver and the stones) come from Mother Earth.” She references this connection to living on the reservation, “where we learned about life.” Jennifer’s competitive side adds fuel to her desire to make pieces that will stand up to her families high standards, as her father never told her she couldn’t do something but fiercely encourage her to prove she could. 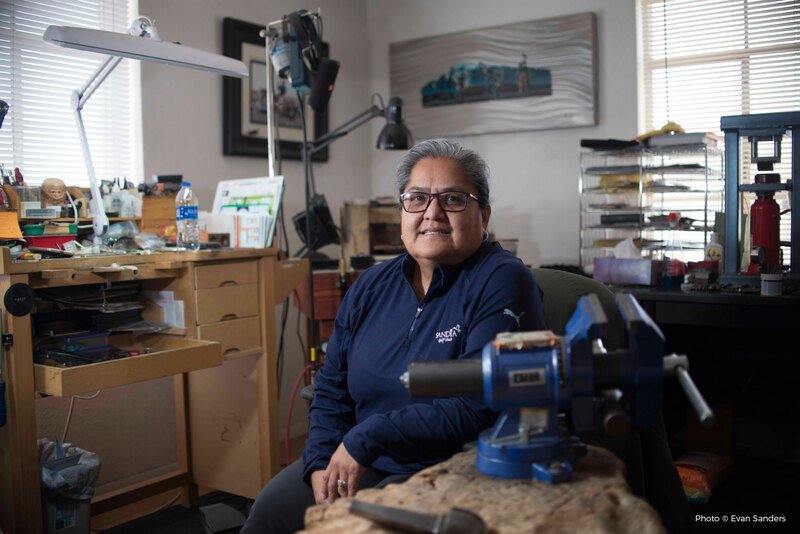 Now she enjoys the challenge, “it is important for me to know where I stand.” Originally she hallmarked her pieces in the typical style, J. Curtis, until her husband mentioned one day that someone would not be able to tell her work was made by a woman. She now marks her pieces with a distinguished ‘Jennifer Curtis’ insignia. Jennifer wants to encourage women to feel their strength and remind them they can do whatever they put their minds to. 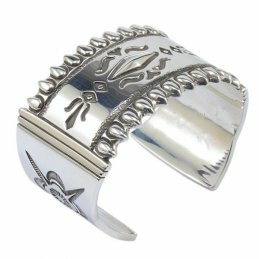 The graceful tenacity of her work reflects her personal fortitude, illuminating the wearer with a reminder of their own unique courage and inner power.